US Soccer has revamped coaching education in this country, beginning with a new pathway for beginning coaches. 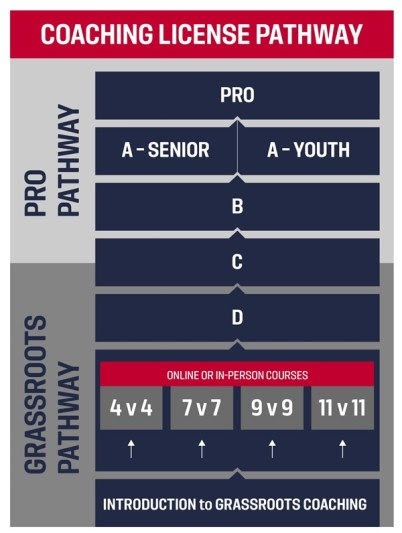 These 5 hour courses REPLACE the USSF E license. They are offered by US Soccer and have theory (classroom), practical (field) sessions, and on online component. The modules are ran by a member of the VYSA technical staff and is geared towards recreational coaches who coach at the various game levels. For example, a kindergarten coach should look to take the 4v4 modules, while a 6th grade coach should take the 9v9 modules. The online component of the 4v4 course is currently available. If you take this course, you can submit for a $25 reimbursement after you complete the course and attach a copy of your license and receipt. The USSF ‘D’ license in a 36 hour course (over two weekends) and for coaches who wish to continue through the US Soccer Federation pathway for coaching education. Coaches who wish to take this licenses must already hold the USSF prerequisite license (a USSF ‘E’ or two Grassroots licenses). The D license is split into two weekends: instructional and evaluation. Coaches must take the instructional weekend first and wait a minimum of 10.5 weeks before they are eligible to take the evaluation weekend. This courses is 50% reimbursable by ASA after completion of the evaluation weekend. Please submit a reimbursement form, a copy of your license, and a receipt of payment.